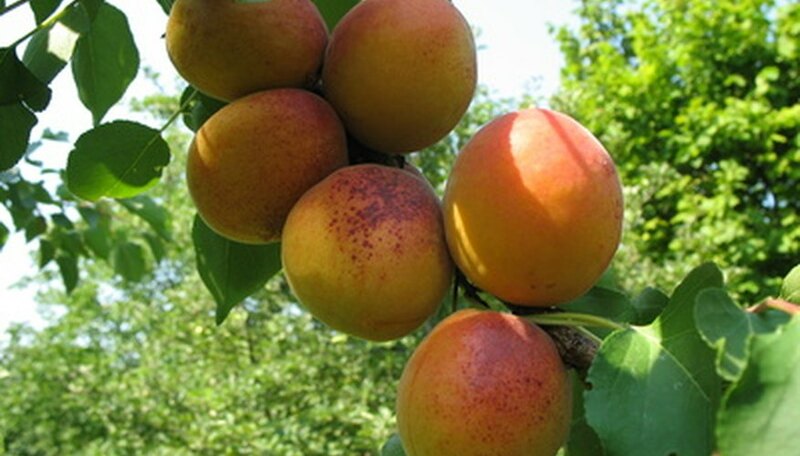 Apricot trees are a less common stone fruit tree for backyard gardeners. This is due in part to their vulnerability to frost. However, they are a rapidly growing tree with a short life span. They require only simple care to keep them growing and healthy. Combine that with their pink blossoms, bronze foliage which then turns green in the summer and delicious fruit, and growing apricot trees becomes far more appealing. Apricots are a stone fruit, and the seed resides within the stone or pit at the center of the apricot fruit. Once the fruit has fallen and decayed or the stone has been harvested, the pit must go through a stratification process or deep cold spell before it will be able to germinate. In the spring the seed can be planted and will germinate in 10 to 14 days, sending up a sprout. Apricot trees grow rapidly, which is probably in relation to their comparatively short life of 20 to 30 years. Growth is rapid enough that apricot trees are capable of bearing fruit by their second or third year. They reach a maximum height of about 15 feet and have a canopy width of about the same dimension. The rapid growth does not require extensive pruning, only shaping to maximize fruit production. Apricots are one of the earliest trees to blossom in the springtime. This can be troublesome for areas with mild springs or those prone to late frosts. Blossoms often do not survive frosts, and this will impact fruit production. Flowers are available for only a week or two. If weather conditions are poor, bees may be unavailable to pollinate, which can also have a devastating impact on fruit production. Depending on the cultivar and the geographic region, fruit can take anywhere from three to six months to reach maturity. In warmer climates such as California, this could be anywhere from May to July; in cooler climates, harvest will be later. Fruit begins to grow in the second or third year but may be sparse. Full production begins between the third and fifth years. A healthy tree will have the best growth. Picking a well-drained site that receives full sun will get the apricot tree off to a good start. Water apricot trees regularly and deeply, especially during dry periods. Add fertilizer if a soil test indicates the need. Vigorous foliage growth can detract from fruit production. Watch for signs of pests or disease, and act swiftly to correct these problems before they damage the tree.